What Are Rock Tumbling Recipes? The Standard Tumbling Instructions Don't Always Work. The photo above shows some of our roughs after being polished. The rock tumbling recipe found on each rough sales page is tailored to the material for best results. We have been running rock tumblers for many years. Sometimes with great results, other times the results were disappointing. Our Rock Tumbling Recipes are a way for us to share our knowledge and experience with you. We want to save you time, money and disappointment by explaining how we have gotten the best results with the roughs that we sell. We have tested many roughs over the years, we sell only the ones that we have been able to produce nice tumbled stones with. The standard instructions work well for small pieces (under about 1 1/2 inches) of agate, jasper and petrified wood - the most commonly tumbled materials. These materials have a Mohs hardness of about 7. However many people want to tumble rough materials that are softer, harder, in larger pieces, easily bruised or broken by cleavage. In these cases the standard rock tumbling instructions can produce less than satisfying results. This easy recipe works for most material with a Mohs hardness of about 7 and a range of particle sizes form 3/8" to about 1 1/2". To help you get the best results possible we have tested and assigned each of the roughs that we sell to one of the following categories. Rough that works well with the standard rock tumbling instructions. All of our crushed roughs fall into this category. 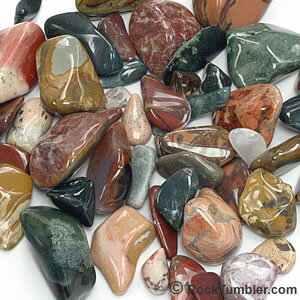 They are agates, jaspers, and petrified woods that are sized "ready to tumble" and have a Mohs hardness of about 7. Rough that needs media or time adjustments. The roughs in this category are generally larger / blocky pieces with not much variety in particle size. These materials might also vary in hardness. For each of these roughs we provide a recipe that we have used to produce nice tumbled stones. Rough that requires special care because it is fragile or bruises easily. Each material in this category has a recipe that is tailored to accommodate it's potential issues. On each page where we offer rough for sale you will find a recipe that we have used to produce good polished stones. The recipes provided are specific for the material that we are selling and take into consideration their physical properties, particle size, and the supplies recommended for use. These recipes may not work on pieces of the same material from different localities or of different size. If you tried one of the recipes with our material please let us know what you think.